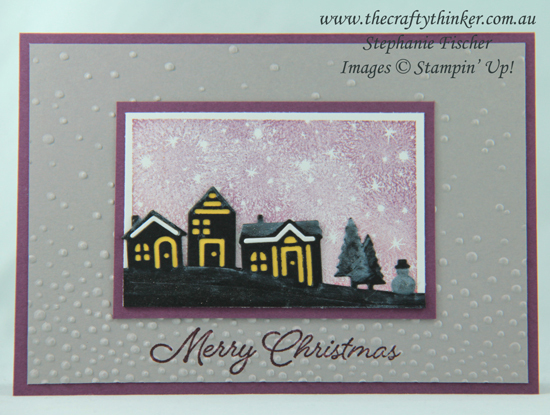 I've recently been having a lot of fun with the Bokeh Dots stamp set - one of the new Distinktive stamp sets. There are two stamps in the set and I decided to use this image as a starry night background. The base card is Fresh Fig and I embossed the Gray Granite layer with the Softly Falling embossing folder after I had stamped the greeting (from Blended Season) in Fresh Fig ink. I cut the smaller houses in the Hometown framelits from Basic Black cardstock and then used a damp paint brush and some White Craft Ink to add snow to the rooves, trees, snowman and a hint in the foreground. I glued some Daffodil Delight pieces to the back of the houses to look like cheery, warm lights. I also cut the same run of houses from Whisper White cardstock and glued a couple of little pieces to the houses. 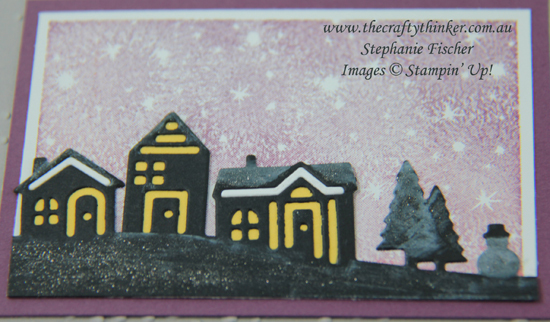 In my next post, I'll share the card that I made with those white houses!